BrightSign, the digital signage media player manufacturer, is showing its new 4K digital signage media players at NAB 2014 in both the Elemental Technologies and Tightrope Media Systems booths. The company announced at the show that its 4K players will support MPEG-DASH, which enables high-quality streaming of media content over the Internet. Eric Henry, in charge of signage solutions at Tightrope Media, was demo’ing his company’s digital signage software and hardware at their booth at the NAB show. BrightSign’s media players were in use in the booth. 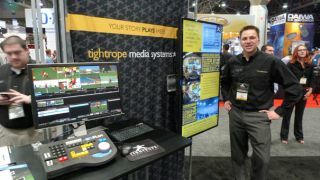 Henry said that NAB attendees, including university digital signage and media professionals, were also interested in Tightrope’s broadcast production tools on display in the booth. The digital signage screen shown in the photo is using a BrightSign XD230 Media Player from BrightSign using a HTML5 rendering engine for 1080P. This past weekend BrightSign demonstrated the latest 4K video technology at the JB&A Video Workflow Pre-NAB Event. BrightSign demonstrated its new 4K player – the industry’s first sub-$1,000 commercial-grade solid-state digital signage media player, for delivery of 4K, with H.265 encoding and HDMI 2.0 for playback at 60 fps.